Returning to the outside world is hard! I’m now back after not blogging for the whole month of October! The short version of the story is that living in the “real world” outside of a fasting clinic made it hard for me to keep my weight, blood pressure, and blood glucose low. 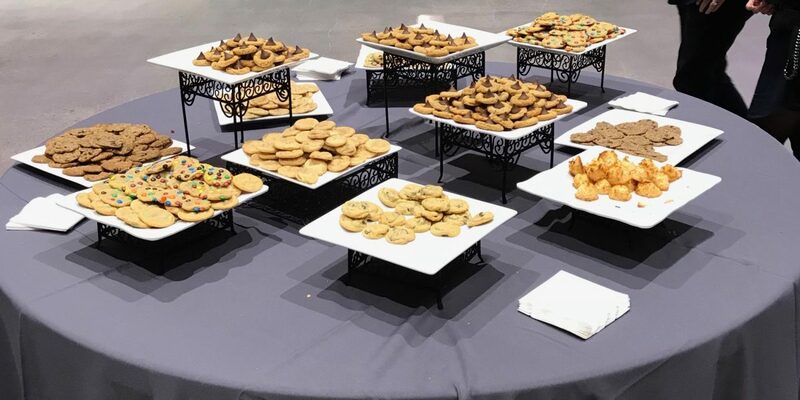 The photo above is indicative of the food temptations abound and shows a cookie table at a reception we attended! The good news is that by the end of the month — with a fasting program designed and supported by my wife — my numbers came down to the levels of a person without disease! medical – My wife and I took an 11-day trip to see our daughters in the Eastern United States. 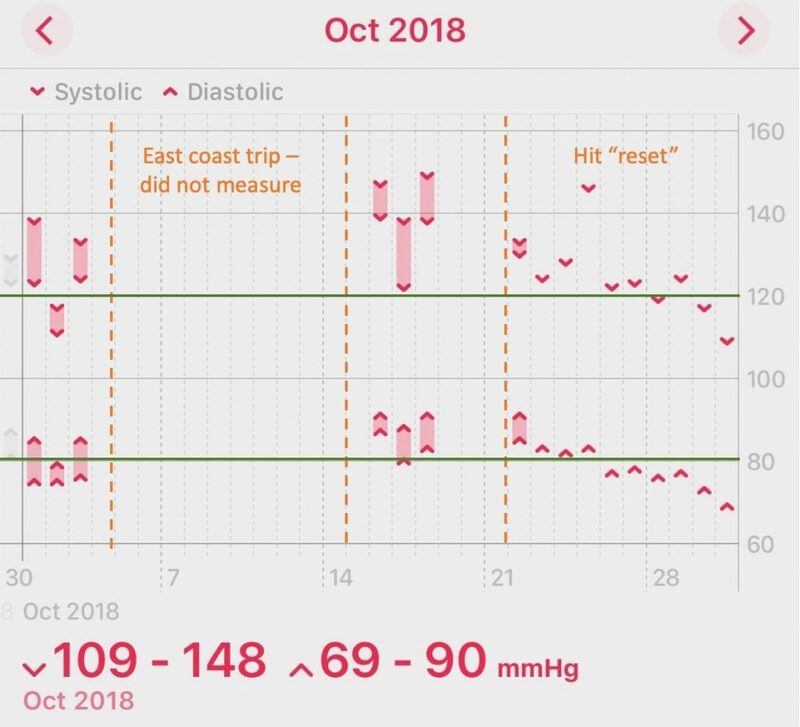 I didn’t take my blood pressure meter with me, so I purposely let daily monitoring lapse through that period. I also did not do intermittent fasting while visiting the kids, causing much of the weight lost during the fasting retreat to come back quickly. spiritual – I was successful in saying my daily “thank you” every morning and practicing autogenic training. nutritional – I did severely limit meat, eating it only several times during the whole month, so I likely did a lot for my gut bacteria. However, numbers (weight, blood pressure, and blood glucose) did rise at first, prompting the beginning of another fasting program at home — this time, a bone broth fast for reasons I may cover more deeply in a future post! The easiest concept to absorb is weight. Here was the story. 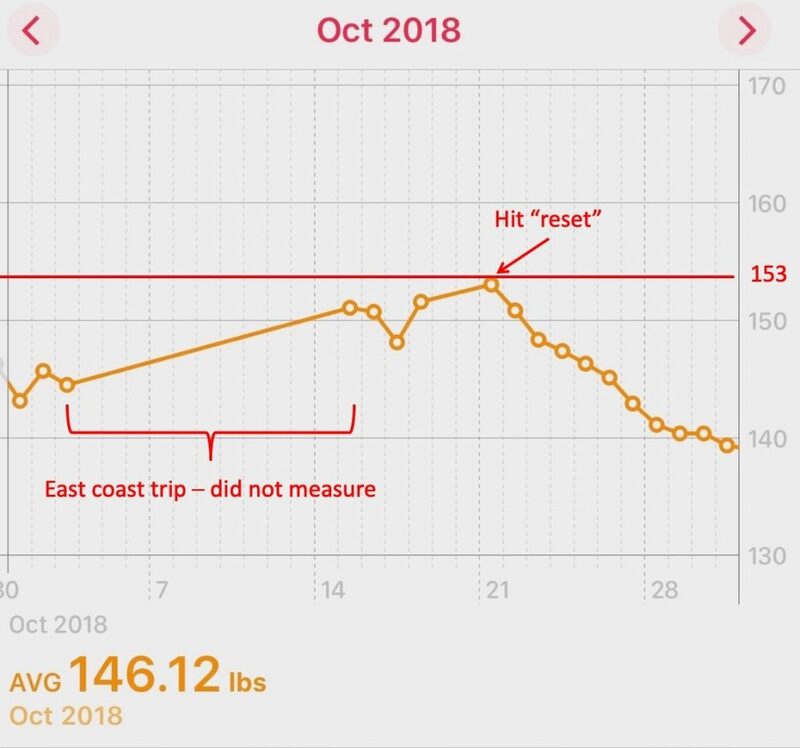 My weight creeped up in October until hitting “reset” with a digestive rest day and a bone broth fast. As expected, bone broth fasting ultimately did return my blood pressure back to normal levels, as well. The green lines below represent the “ideal” systolic/diastolic of 120/80. 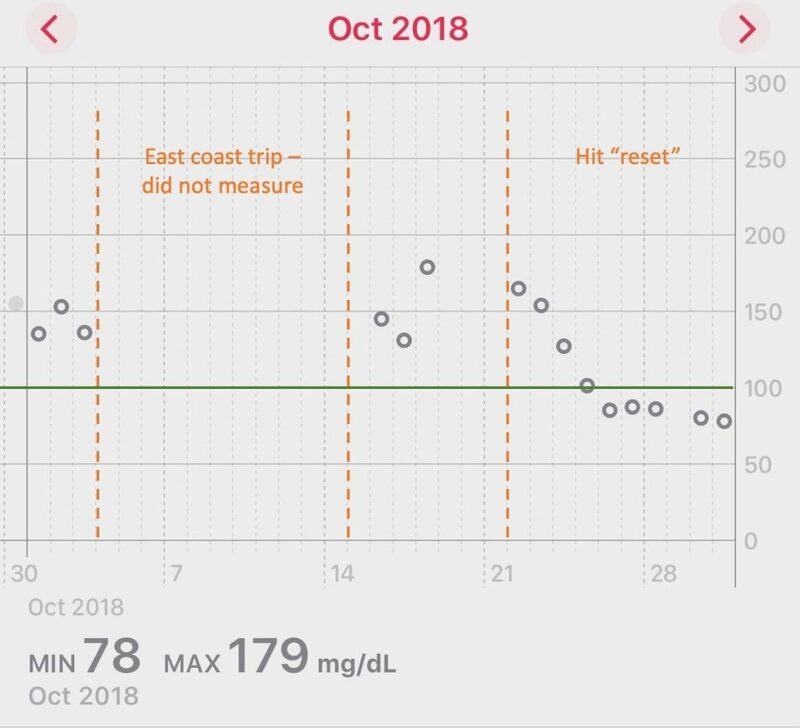 The best news of all, however, was the impact that the bone broth fasting had on the morning blood glucose levels. I got below 100 — the threshold at which a person is no longer diagnosed with diabetes at all — and for the first time since being diagnosed with diabetes, my morning readings got below 80! For the short term, this is positive. My doctor at Buchinger Wilhelmi correctly predicted that now that I know how my body is responding, I can always return to fasting. However, the trick here will be to establish a set of routines that don’t require such extreme measures. The program my wife designed was a 14-day bone broth fast, followed by a 3-day refeeding period, that more-or-less restricted us outright from social eating with friends. We have already scheduled out friends for the days immediately following our home fasting program. For now, the plan is to enjoy the holidays when our kids return home from college for Thanksgiving and then Christmas, do 36-hour fasts 3 times per week during the times in November and December that they are in school, and do another prolonged fast in January. I’ll aim to do a better job blogging about the progress! I’ve heard that fasting as part of your normal routine can be really good for you. I’m anxious to see how it works for you! You must have a lot of will-power….I don’t know if I could fast for three days!! Keep up the blogging. I enjoy reading it. Steve – you may want to look into a point of care monitor for cholesterol – Walmart sells them, I’m sure others are available online. It would be a easy way to track this along with blood glucose.